According to a report in the Südhessen Morgen, 2 April 2013 GPS devices for outdoor use are selling like hot cakes. It is no longer just nerds who are buying the instruments but also normal cyclists who want to have a quick tour at short notice. 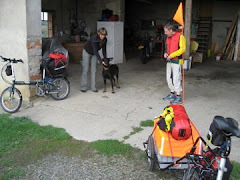 Thomas Froitzheim of the Allgemeiner Deutsche Fahrrad Club (ADFC), the German cycle touring club, pointed out that newer systems offer the comfort of the navigation systems for motorists combined with outdoor touring maps. One enters either a target or a time limit and the GPS device works out a route, often using an audio system to describe which way to go. Obviously there are still buy instruments available where the cyclist or walker needs to work out a route on his or her PC which is then transferred to the GPS device. This stage will be a critical point for us, as a number of these instruments and their map collections only recognise Microsoft Windows® systems, which is not much use for those sensible souls who use Apple Macintosh computers. The more modern GPS devices help the errant cyclist who leaves the suggested route to return to the path of righteousness, whereas the older systems show the route and the cyclist's position letting him or her find their way back. However, Thomas Froitzheim thinks that both the older simpler and the newer systems suffer from content quality. There is not yet enough information about the quality of cycle routes built into the system. We think it would be better if cyclists could specify the most scenically interesting route or the one with the best tea rooms, etc. This could be the app the cycling world is waiting for.